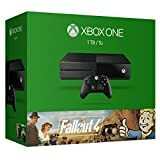 The week of Xbox One bundles is finally wrapping up, with what may be the most exciting bundle of all: the Xbox One 1TB Fallout 4 Bundle. Priced at $399 and available starting on November 10th, this new 1TB bundle includes a copy of Fallout 4 (we assume on disc), and a full game download of the backwards compatible Xbox 360 version of Fallout 3. Pre-order that sucker right here at Amazon. Stop by the Xbox Wire site for more info. a And today, we’re thrilled to give fans the opportunity to “welcome home” the ultimate Fallout experience, with the Xbox One Fallout 4 Bundle, featuring a 1TB hard drive, the critically-acclaimed Fallout 4, and a full-game download of Fallout 3. Experience the next generation of open-world gaming from Bethesda Game Studios, the award-winning creators of Fallout 3 and Skyrim. Play and store more games than ever, including Fallout 3 and other Xbox 360 games, with the 1TB hard drive and Xbox One Backward Compatibility. And don’t forget, Fallout 4 players will be able to play PC mods free, first on Xbox One. The Xbox One Fallout 4 Bundle will be available in November for $399 USD.